Olde Worlde Oak Joinery is an established family run business, manufacturing quality bespoke oak doors to clients throughout the U.K. The company is owned by Robert and Samantha Carless. Robert has been involved in the joinery business since serving a fully indentured apprenticeship as a young lad, and he has gained vast amounts of knowledge within the industry over the years. Robert has invested in state of the art machinery, and with his fully qualified team he is able to provide a professional joinery service to a varied range of clients including local governments, architects, builders, property developers and private individuals. Each product is carefully designed and hand-finished by their dedicated craftsmen. Every piece of timber is carefully selected to ensure its suitability,resulting in a product that captures the aura of years gone by. This makes them an obvious choice for period properties and barn conversions. 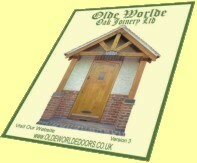 "At Olde Worlde Oak Joinery we pride ourselves on giving a friendly, personal service to all of our customers. Free advice and consultation is available if required. As a family run business, we invite you to experience the beauty and craftsmanship of Olde Worlde Oak Joinery's range of products." All items whether standard or bespoken are made to order, offering customers maximum choice and flexibility. Nationwide delivery is also available using company transport.